As many of you have noticed on social media lately our male Wild Turkeys, or toms, are being quite aggressive and putting on quite the show. Actually that’s right on cue for Wild Turkeys on Seabrook Island as breeding and nesting for Wild Turkeys begins in late February around this part of the east coast. Increasing day length and warmer weather determine the date when the breeding season begins. You might be interested in knowing some Wild Turkey facts. 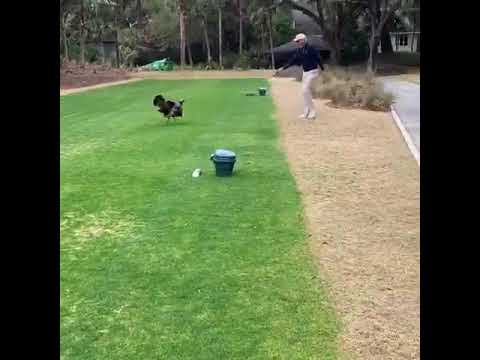 A Wild Tom Turkey, with his brightly colored head, gives a loud gobbling call to attract females and then puffs up and fluffs his feathers, swells the wattle, and spreads, drops and drags his wings while strutting around in a mating dance. All of that plus some humming sounds entices the female. Once mating occurs, that female goes off to find her nesting site while the male can continue looking for other females. The male might mate with three or four other females. Interestingly, after the female turkey, dully colored for camouflage, finds her ground nest site, will lay only one egg. She will cover the egg with ground debris, then leave to feed and roost elsewhere. The next day she will lay another egg in the same nest and then leave again. This continues until she has laid all her fertilized eggs, which usually number from nine to thirteen. Then she will sit on the nest for the next twenty eight days as the eggs incubate leaving briefly once a day to feed. Because the nest is on the ground, the eggs are at risk from predators such as raccoons, bobcats, opossums, and even snakes. However, on Seabrook Island the turkey population seems to be growing so we must have more Wild Turkeys than predators. Apparently Wild Turkeys have a pecking order within their flock. During mating season the males become quite aggressive towards anything they perceive as a threat. I thought the tom was seeing his reflection on the car and was attacking what he thought was another male. And, this might have been the case. 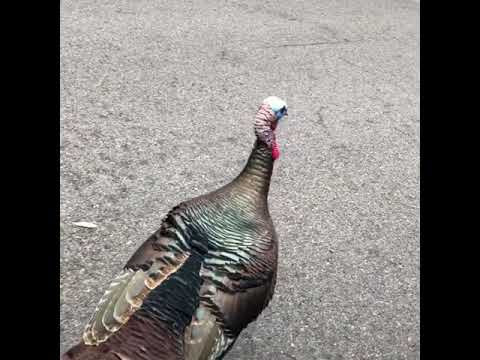 However, it was also suggested that turkeys have lost their fear of humans and assimilated to life in neighborhoods, and that this tom with his hormonal spike, might have seen the automobile as the threat and was trying to knock the car down the pecking order. Don’t feed Wild Turkeys as this can cause them to act tame and may lead to bold or aggressive behavior. You may threaten a bold or aggressive turkey by making loud noises, swatting it with a broom, or spraying water from a hose. Turkeys can also respond aggressively to shiny objects like car windows, mirrors and polished car doors. It is recommended to cover the reflection if possible. So, maybe we should all keep a broom handy when we drive or walk around Seabrook Island so we aren’t knocked down the pecking order. Just keep in mind Wild Turkeys can run up to a speed of 25 mph and fly at a speed of 55 mph. Have fun, it’s only six more months until deer mating season!